Song Of My Self-Help: Follow Walt Whitman's 'Manly Health' Tips (Or Maybe Don't) In 1858, the poet published a series of advice columns — titled "Manly Health and Training" — in which he recommends wearing a beard, taking a cold bath every morning and avoiding condiments. "Manly health!" Whitman wrote in the New York Atlas. "Is there not a kind of charm -- a fascinating magic in the words?" 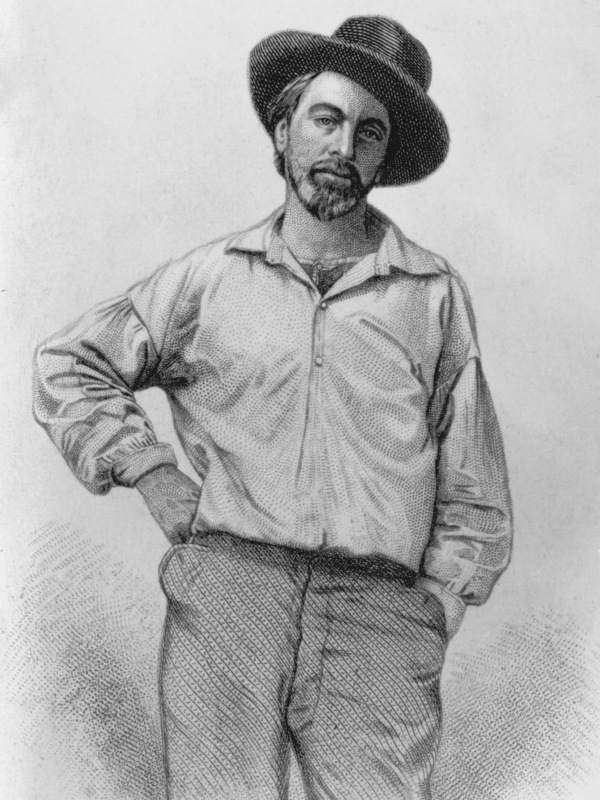 The poet is seen here in an engraving that appeared in several editions of Leaves of Grass. Eat lean meat. Bathe regularly. Wear comfortable shoes. Those are three pieces of self-help advice from an unlikely source — 19th-century poet and essayist Walt Whitman. They come from a series of advice columns titled "Manly Health and Training" which Whitman — better known for Leaves of Grass and "O Captain! My Captain!" — wrote under the pseudonym Mose Velsor. The columns were discovered by University of Houston doctoral candidate Zachary Turpin. He tells NPR's Scott Simon that identifying Whitman as the true author was "a rare open-and-shut case." On beards: "The beard is a great sanitary protection to the throat — for purposes of health it should always be worn, just as much as the hair of the head should be. Think what would be the result if the hair of the head should be carefully scraped off three or four times a week with the razor! Of course, the additional aches, neuralgias, colds, &c., would be immense. Well, it is just as bad with removing the natural protection of the neck; for nature indicates the necessity of that covering there, for full and sufficient reasons." On what to eat: "If you want to know what is best to a hearty man, who takes plenty of exercise and fresh air, and don't want any pimples on his face or body, we will answer, (perhaps very much to your astonishment,) a simple diet of rare-cooked beef, seasoned with a little salt, and accompanied with stale bread or sea-biscuit. Mutton, if lean and tender, is also commendable. Pork should not be eaten. Butter, pepper, catsup, oil, and most of the 'dressings,' must also be eschewed. Lobster and chicken salad, cabbage, cucumbers, and even potatoes, are to be turned away from. Salted meats are not to be partaken of either." On shoes and socks: "Probably there is no way to have good and easy boots or shoes, except to have lasts modeled exactly to the shape of the feet. This is well worth doing. Hundreds of times the cost of it are yearly spent in idle gratifications — while this, rightly looked upon, is indispensable to comfort and health. The feet, too, must be kept well clothed with thin socks in summer, and woolen in winter — and washed daily." On cold baths: "We have spoken before of the morning ablutions — we mean the cool bath for the whole body. No doubt many of our readers will start back in dismay from such a proposition this weather [sic]; yet this is what we seriously mean. Not, be it well understood, for the feeble, the puny, the invalid, but for the robust, the young, and the sound only. This, cautiously begun, and by degrees formed into a habit, will so invigorate the whole surface as to make one indifferent during the day to the severest cold, and enjoy comfort in it, while others are chilly and shivering." On dancing: "We recommend dancing, as worthy of attention, in a different manner from what use is generally made of that amusement; namely, as capable of being made a great help to develop the flexibility and strength of the hips, knees, muscles of the calf, ankles, and feet. Dancing, on true principles, would have ultimate reference to that, and would then, as an inevitable result, bring grace of movement along with it." Whitman's 13-part "Manly Health and Training" series was originally published in the New York Atlas in 1858, and is now being republished by the Walt Whitman Quarterly Review. You can read the full text of his columns here. Nicole Cohen contributed to this story.